Life LED Lighting makes sense, helps save the environment and saves you money! 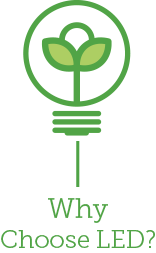 Unlike incandescent bulbs or CFL's which release 80-90% of their energy as heat, LEDs use energy far more efficiently with little heat emitted. You will make significant financial savings over alternative lighting types. Replace your standard lighting with LED’s now and start saving immediately. See the case studies. Cost recovery in a very short time. Even though LED lighting is more expensive than standard bulbs, the savings in the everyday running costs, more than covers the initial purchase cost. Lower maintenance costs. Especially relevant when your metal halide high bay lamps fail and you have to, not only cover the cost of the bulb, but more expensively, the cost of scissor lift hire. Even the cost of electrical contractors is saved over the life of the LED’s as replacements of fittings and bulbs, is not required during the warranty period. Lower replacement costs (up to 5 year manufacturer’s warranty). You can expect not to have to replace a bulb at your cost in this period. This equates to 50,000 hours of use. Halogen and other types of bulbs do not have the same life span as LED’s. Lowering Greenhouse Gas emissions. LEDs contain no mercury, and have a much smaller environmental impact than incandescent bulbs. Uniform lighting throughout your property. LED lighting does not dim or colour change through its effective life unlike the deterioration of metal halide lighting, especially evident in the retail environment. LED lights are at full brightness as soon as they are turned on. Metal halide lights take some time to warm up to operating temperature. No cooling down and re-starting lag time following power disruptions. LED lights operate at full capacity when switched on, unlike metal halide lamps that when tripped off, require a cool down period before coming back on again. Many can be retro fitted in current fittings or ceiling spaces. The new LED tubes never flicker and can be dimmed and will fit into the standard fluoro fittings. LEDs are directional, focusing light in ways that are useful in homes and commercial settings. They emit light in a specific direction, reducing the need for reflectors and diffusers that can trap light. This feature makes LEDs more efficient for many uses such as recessed downlights and task lighting. With other types of lighting, the light must be reflected to the desired direction and more than half of the light may never leave the fixture. LEDs are a coloured light source and are designed to produce white light using a number of methods. As a result, they can actually produce white light in a number of “shades” or “colour temperatures” just like a CFL or fluorescent tube – from warm-white (similar to regular incandescent and halogen lamps, 2700 to 3000 Kelvin) to cool-white (around 4000 Kelvin) or bluish white (daylight, 5000 or more Kelvin). From traffic, street, car park lights and vehicle brake lights to TVs and display cases, LEDs are used in a wide range of applications because of their unique characteristics, which include compact size, ease of maintenance, resistance to breakage, and the ability to focus the light in a single direction.